I can’t get to my computer! It was not possible to get much computer work done yesterday. Our almost-four-year-old grandson was here Sunday night and Monday. 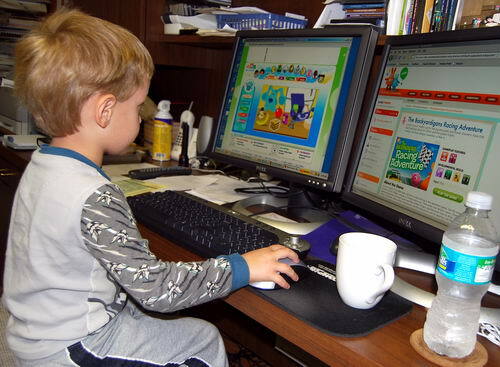 You can see from this photo that he took over the computer for his games. Not really. We had lot’s of fun doing a variety of things. Drew takes over the study. I am reminded of Psalm 128. It has been my pleasure to visit Damascus several times since 1967. David McClister, a colleague from the Biblical Studies department at Florida College, and I visited the city in May, 2002. We tried to identify the traditional places associated with Saul’s stay in the vicinity. 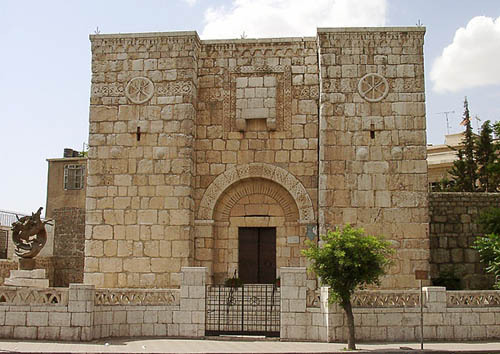 Southwest of the city, within sight of Mount Hermon, and on the road toward Jerusalem, there is a Greek Orthodox chapel marking the site where Jesus spoke to Saul. We drove as far south toward Quneitra in the Golan Heights as the military would allow. We can not be sure that the chapel marks the exact spot, but we know it was nearby. Off Straight street one can visit the house of Ananias. All we can say with certainty is that this is another of those uncertain traditional places. Luke tells us that Ananias went to the house of Judas where Paul was staying. An ancient wall still surrounds much of the old city. A modern chapel is built into the wall to indicate the place where Paul was let down through a window when a plot was made to kill him (Acts 9:25; 2 Cor 11:32-33). Damascus is first mentioned in the Bible at the time of Abraham (Gen. 14:15; 15:2-3). As the capital of Syria, the city had much contact with the kingdoms of Israel and Judah. All of the New Testament references to Damascus are related to the conversion of Saul of Tarsus (Acts 9; 22; 26; 2 Cor. 11:32; Gal. 1:17). Saul had participated in the stoning of Stephen and was active in the persecution of the disciples of Christ in Jerusalem. He asked the high priest for authority to go to Damascus and seek out men and women who belonged to the Way and bring them bound to Jerusalem. The Lord appeared to Saul as he approached Damascus and told him to go into the city where he would be told what he must do (Acts 9:6). Saul stayed at a house on the street called Straight. Ananias came to him and told him to arise and be baptized so that his sins might be washed away (Acts 22:16; 9:18). Saul stayed with the disciples for several days and immediately began to proclaim Jesus in the synagogues as the Son of God (9:20). The street called Straight (Acts 9:11), the ancient Via Recta of the Roman city, now lies about 20 feet below the present street which runs the length of the old city, east to west. At the east end of the street a Roman gate has been elevated to the present level and partially restored. A small monumental arch can be seen near the middle of the street. The photo below is one I made on Straight Street in 2002. This is not the main shopping street in the old city, but is historically significant. 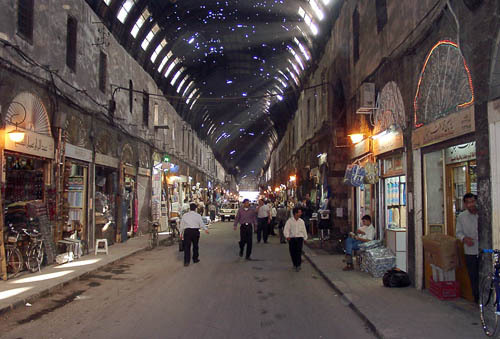 The street called straight in Damascus. Photo by Ferrell Jenkins. Naaman was the commander of the army of the king of Aram (Syria). The biblical text says he was “esteemed and respected by his master” because of the victories he had given the country. Great people often have great problems as well as great acclaim. Naaman was a leper. The term leper is used throughout the Old Testament of a serious skin disease without a cure. Read the full account in 2 Kings 5:1-18. A young girl who had been taken captive from Israel during one of the raids made by the Arameans was serving as an attendant to Naaman’s wife. She knew of the prophet [Elisha] in Samaria and was confident he could cure Naaman of his leprosy. These rivers, Abana and Pharpar, flow from the Anti-Lebanon range eastward into the desert. Here is a photo that I made of the Nahr Barada river a short distance west of Damascus (on the outskirts of the city). The river continues to flow through the city of Damascus. The Nahr Barada is often identified with the Abana of the Bible. 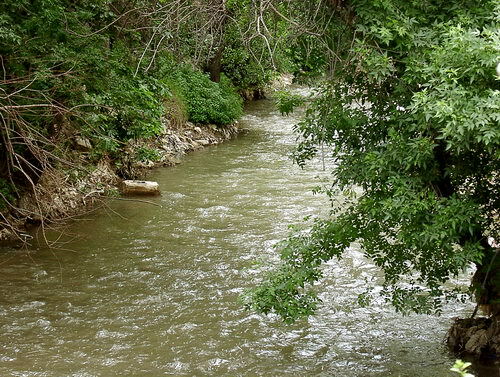 The Abanah River near Damascus. Photo by Ferrell Jenkins. Naamam was cured of his leprosy only after he dipped in the Jordan seven times. We should not elevate our judgment (opinion) to the point that we can argue with the Lord about what ought to be done. He is the Creator; we are the creature. A month ago I wrote about visiting the Herodium here. Even though I have multiple thousands of photos from Israel, I still use photos from Todd’s Pictorial Library of Bible Lands regularly. Every person who teaches the Bible and uses presentation software should have his collection. See BiblePlaces.com for details. Photos like this help to make Bible lessons come to life. Students of the New Testament probably realize that the Roman Empire was vast. Did you know that there are ruins of a large Roman city in Morocco in north eastern Africa? 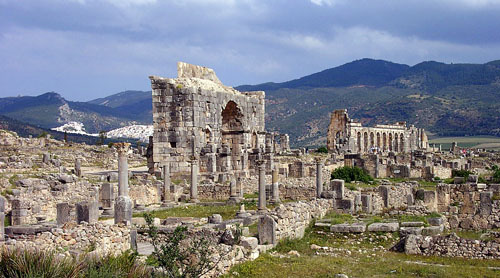 Twice I have taken tours to Volubilis, about 20 miles from Meknes. Most of the ruins in the city date from the second and third centuries A.D. I have a slide from a 1980 tour with the name of the first century emperor Claudius (A,D, 51-54) on it. This was the time of Paul’s journeys (Acts 18:2). This photo shows the Triumphal Arch dedicated to the Emperor Caracalla and his mother in A.D. 217. The Roman Basilica is visible on the right. Roman ruins of Volubilis in Morocco. Photo by Ferrell Jenkins. 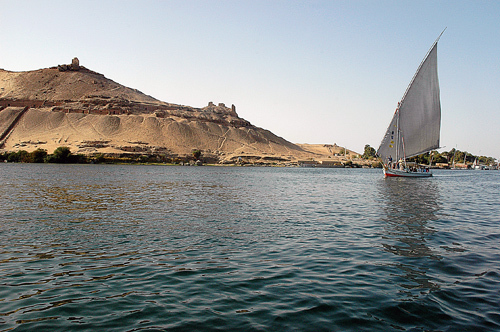 Aswan is the location of the first cataract of the Nile River. This made it an ideal location for the Aswan Dam which was built between 1898 and 1902. This created a small lake south of the dam, but it was nothing to compare with Lake Nasser which has been formed as a result of the building of the new high dam at Aswan between 1960 and 1971. The new high dam was constructed at a time when the Soviet Union was providing technical, economic and military support to Egypt. I remember staying in a hotel in Egypt in 1973 filled with Soviet tourists. In the following years we saw none of them. Lake Nasser stretches south for more than 300 miles. Many of the Nubians who lived in this area had to be resettled by the Egyptian government. Kitchener’s Island, shown below, was given to Lord Horatio Kitchener for his service in the Sudan Campaign. It now is owned by the state and is the site of a beautiful botanical garden. The Mausoleum of the Aga Khan is visible on the top of the hill in the photo below. Some scholars identify the Arabic name Aswan with the Syene of Ezekiel 29:10 and 30:6. It may be identified with the Sinim of Isaiah 49:12. The Nile River at Aswan. Photo by Ferrell Jenkins.